If by chance you found yourself driving on the Hachioji Highway in Kitamachi, West Yokohama, there’s a possibility that you may catch sight of a bright red building in your peripheral vision. This building, although by its outer appearance may seem a bit uninteresting, is actually a haven of unique automotive modification you’d be hard pressed to find elsewhere, and that’s precisely why it was my destination that afternoon. Hesitantly leaving the sanctuary of the air conditioned van, we were immediately greeted with an unseasonably sharp heat; almost as if the sun had an increased need for people to notice it that day. Sato was parking a flatbed opposite us as we approached. As he jumped down from the cab to meet us you could see right away that he is different than most well-known shop owners in Japan. The sternness of his neutral expression faded instantaneously when he smiled as he turned to see his new visitors. The transmission broke!”, he said in a somewhat light-hearted, yet disappointing tone that seems to only be portrayed correctly in Japanese. It took me a second to realize he was referring to the Evolution that he had just unloaded that his two employees, Nabeshima and Sekita, were now maneuvering into the back of the shop. 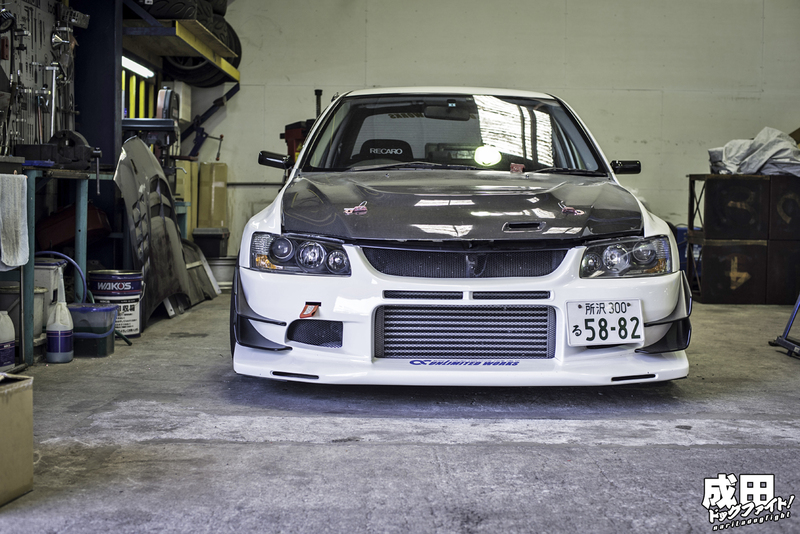 As he explained that this particular EVO 9 is probably the 5th or 6th fastest street EVO in Japan, the lack of worry in his voice made sense now; this sort of thing happens often when you tune cars at the level Sato does. 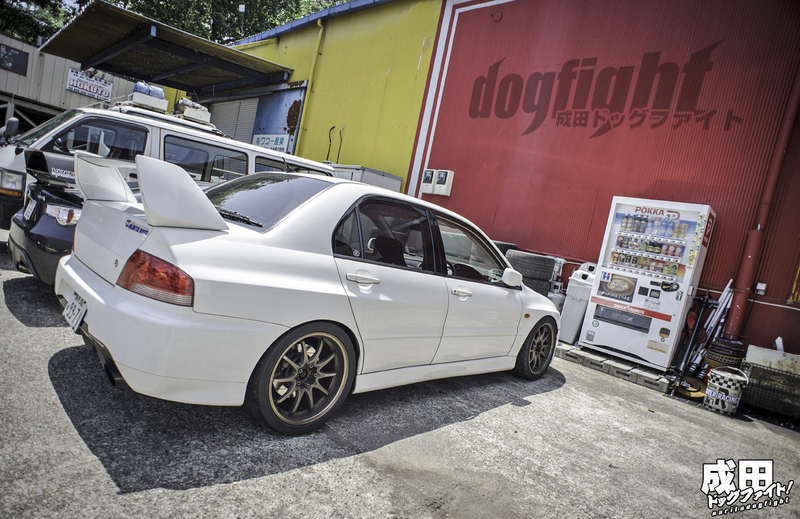 Over the past eight years, Kazuhiro Sato, or ‘Kaz’ for short, owner of Unlimited Works, has been tuning Evolutions in a way specific to his ideals; ideals that have helped him to achieve the bragging rights of having the fastest street Evolution in Japan. 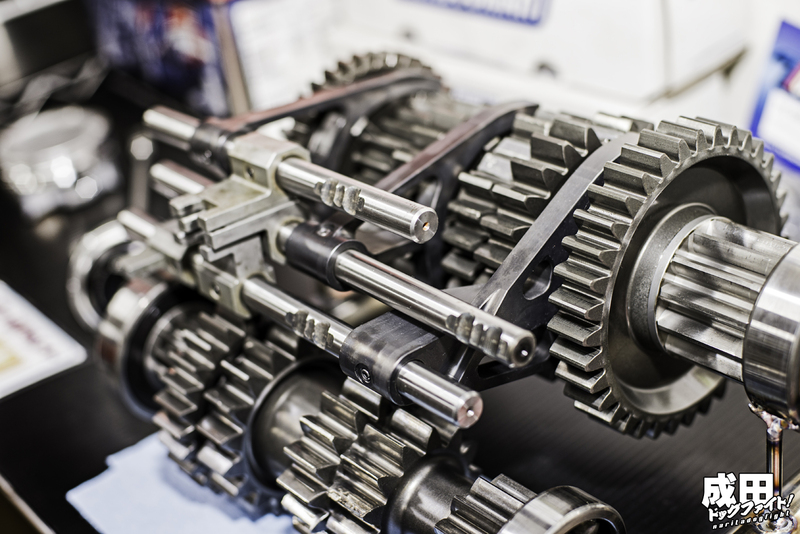 Tired of tuning cars to specifications in a biased manner, and always putting numbers first, Sato made the decision to branch out on his own in the summer of 2006. Believing that you shouldn’t have to sacrifice drivability and comfort for speed, he opened up Unlimited Works with his two right hand men. 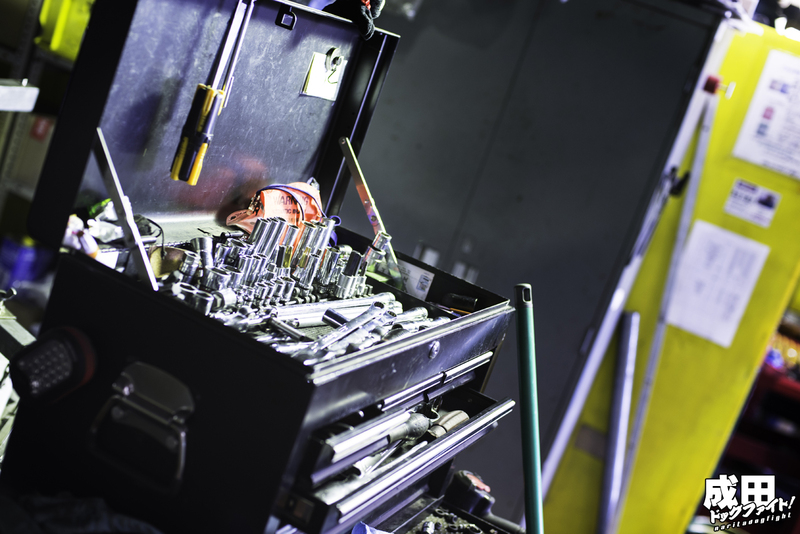 Concentrating on knowing exactly what their customer’s requirements are, they form a relationship with them not unlike many other shops; a relationship that allows them to enjoy the experience of tuning together. 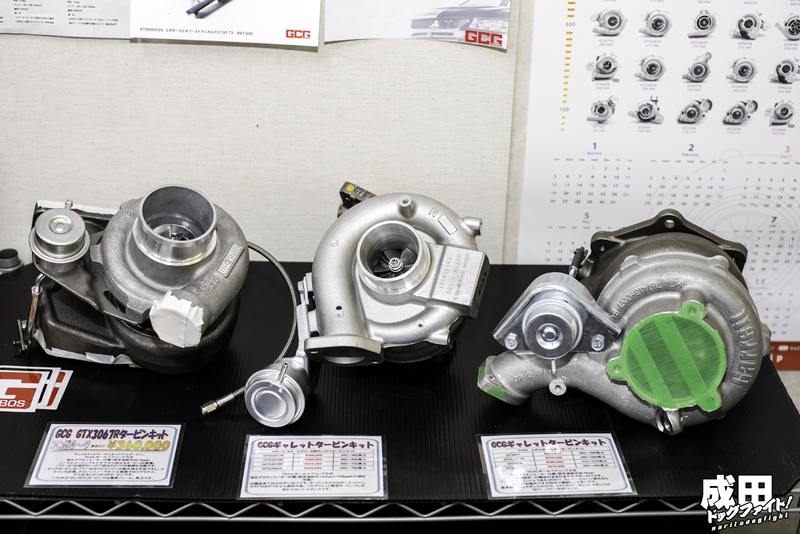 As an example he mentioned working with a recent customer wanting a very large turbo, “It’s no good to install a turbo that will give bad response with a street car. Because it is the owner’s car, the owner will drive; they are not pro driver.” So, in working closely with the customer they are able to accommodate their needs in the most efficient and safe manner. Although this may seem as a sacrifice in some ways, you’d be wrong to interpret these ideals as a way of holding back. Just because Unlimited Works’ final power numbers are lower than other Evo shops in Japan, does not mean that they are slower on track. Kaz is quick to point out this out when discussing the ‘competition’. “Look at the lap times! Look at their lap times!” he excitedly denounced when discussing another well-known shop that which, for the sake of diplomacy, will remain nameless (*cough*G-Force*cough*). Sato’s philosophy of ‘Drivability, above all’ has been proven with his personal build time and time again. 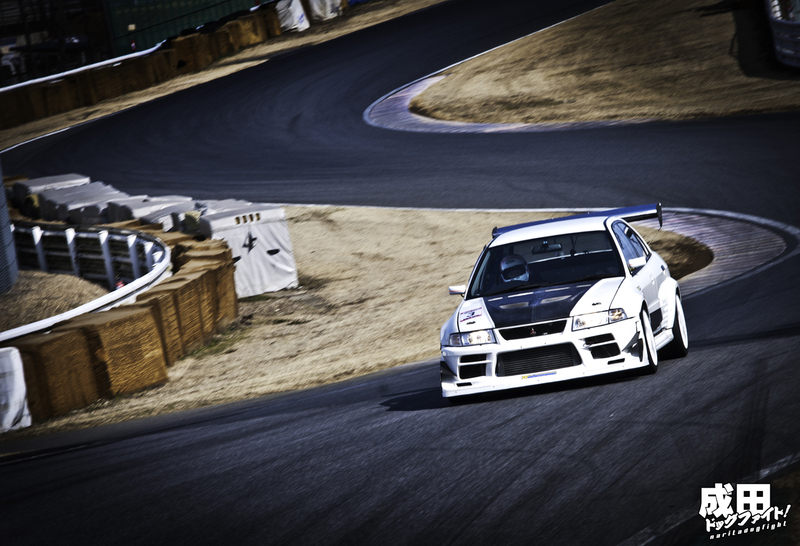 His EVO 6, which has taken the title of fastest street-registered EVO in Japan, consistently runs low 56 second lap times at the proving grounds of Tsukuba’s TC2000. If that wasn’t significant enough, it may be worth point out that the car is still comfortable enough to drive to and from the track. This is testament to why he chose to make a career out of the Evolution line to begin with. 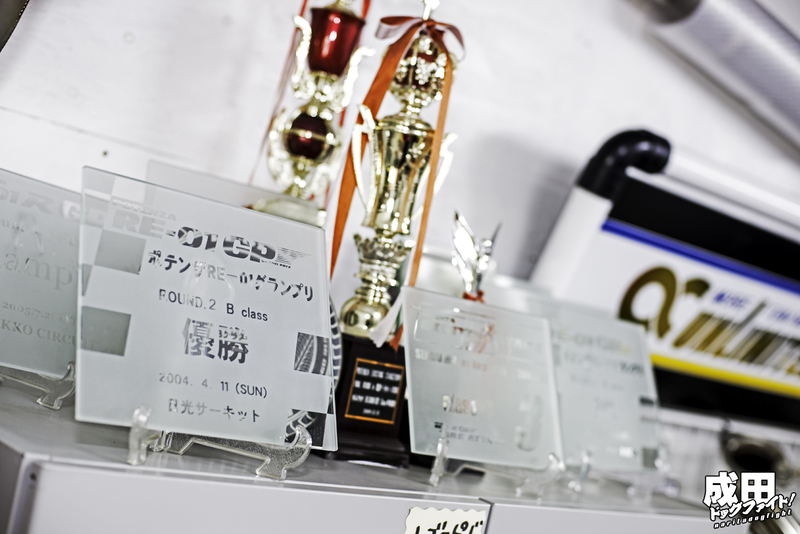 If that isn’t enough, then one just need to advert their gaze to the dozens of trophies displayed in Sato’s office. 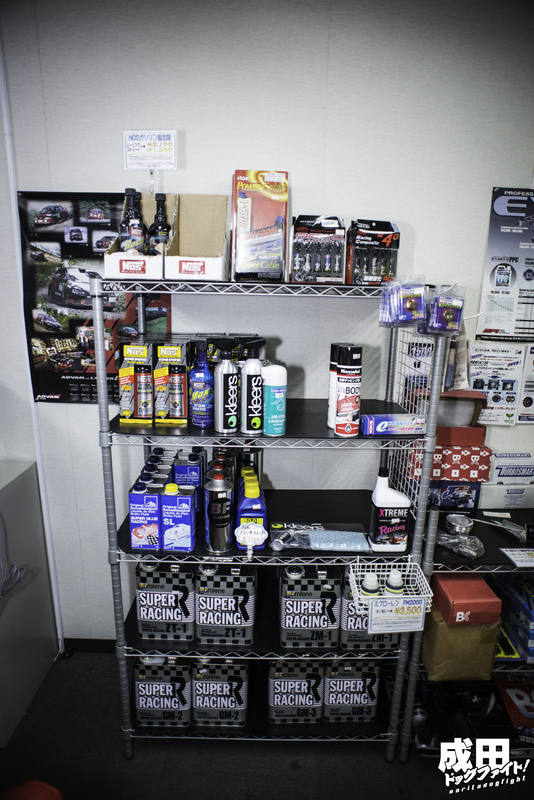 Everything from Time Attack events, to Endurance races; cars built by Unlimited Works have placed in all. 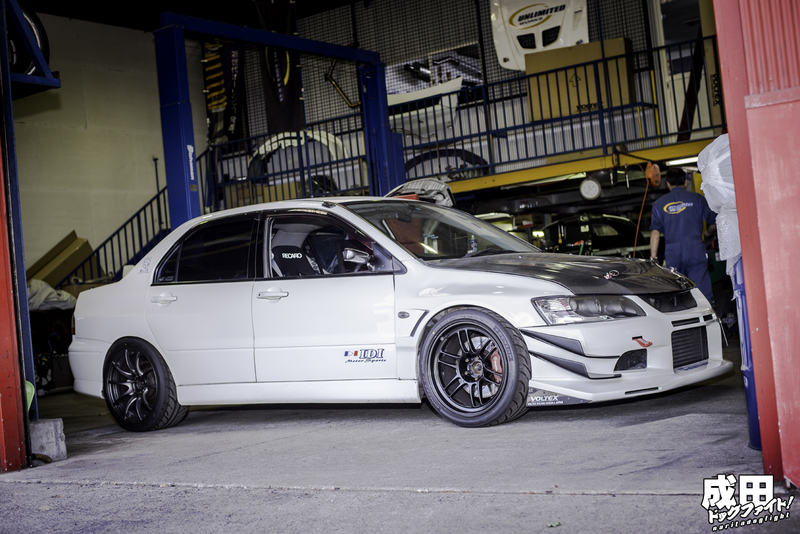 This of course, being said fastest EVO. Seen here at Tsukuba last year being driven by none other than Sato himself. 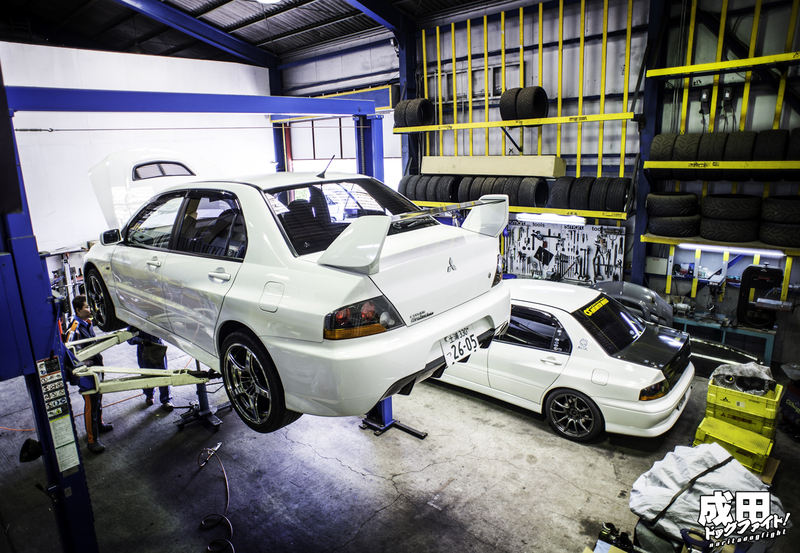 Along with their knowledge in tuning Evo’s, over the past several years they have been hard at work developing various in-house products to offer as well. 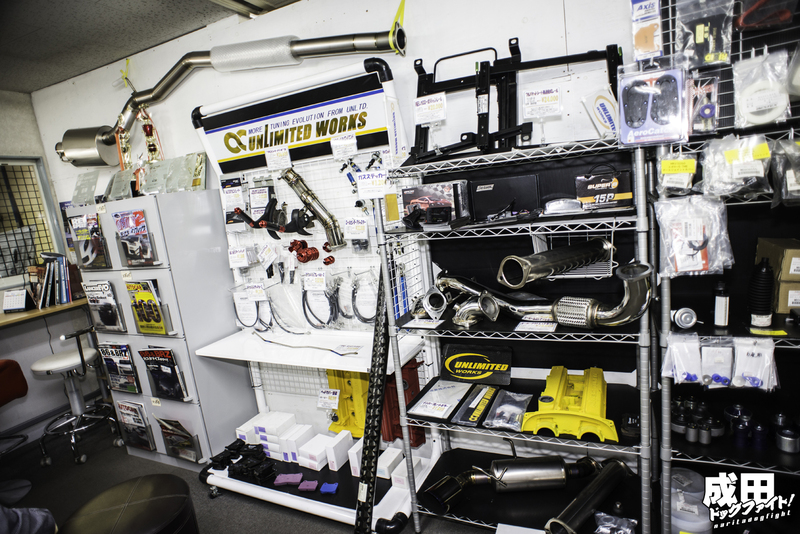 Exhausts, Manifolds, various turbo packages, and even a handful of suspension pieces now bear the Unlimited Works name and quality. 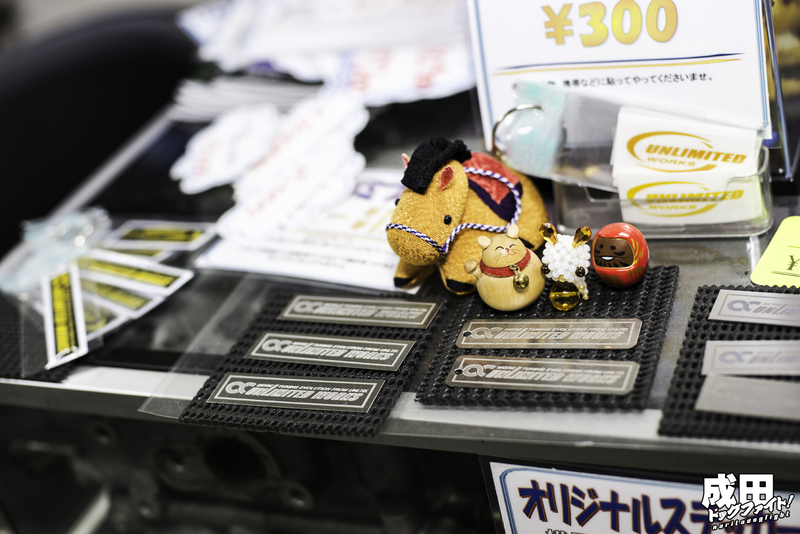 They’ve also had their hands on some pretty high profile builds as well. 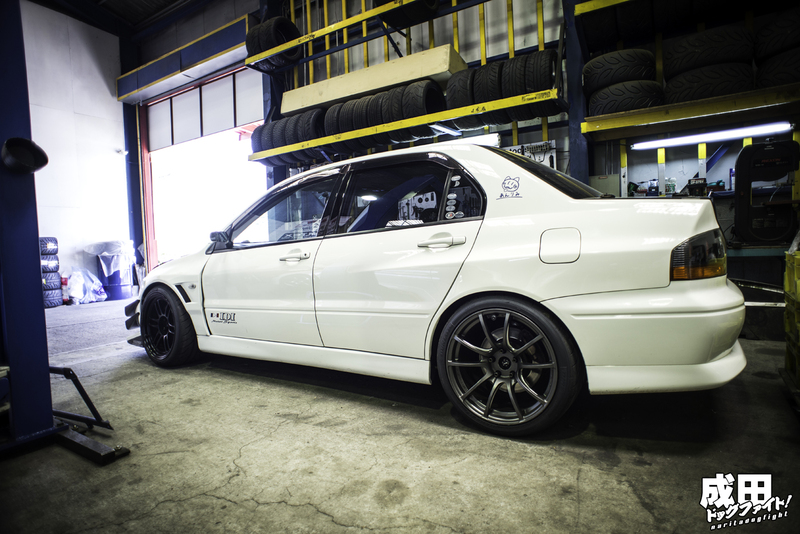 I’m sure you’ve all heard of the Cyber Evo, but it’s very unlikely that you knew the shop behind its build. 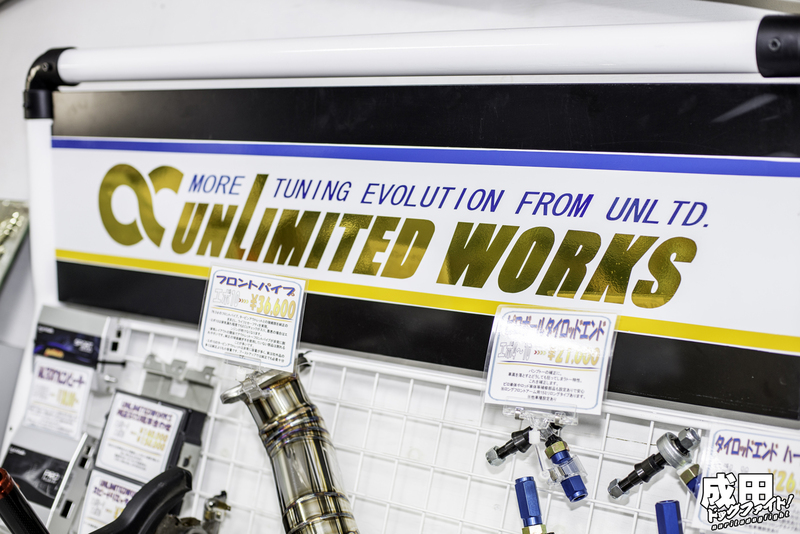 That’s right; Unlimited Works played a crucial role in the build of the iconic time attack Evolution including all the maintenance and ECU development throughout its active tenure on circuit. 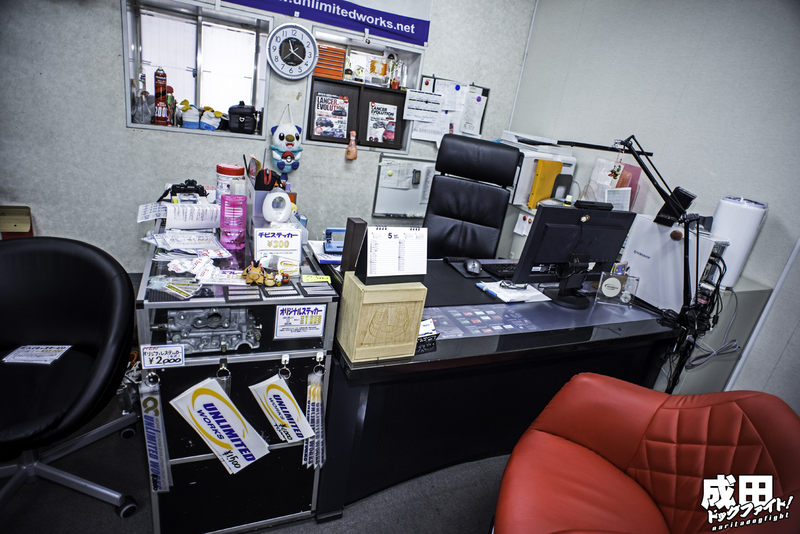 The upstairs office and showroom is filled with various products and little ‘Anrima’ trinkets. Various fluids and automotive cleaners. Line up of GCG turbo packages. It’s rare these days to find someone as enthusiastic as Kaz. He is so adamant of the functionality of the Evolution chassis that, in his own words, “…they are fast, cheap and unbreakable. They can be used in the comfort of daily life and yet be fast on track. The effect of tuning is large. It is my favorite car, I am in love.” I guess you could say his dedication to this particular automotive lineage is truly, Unlimited. How did he feel about the Evo X platform? Loved the article, keep em coming! 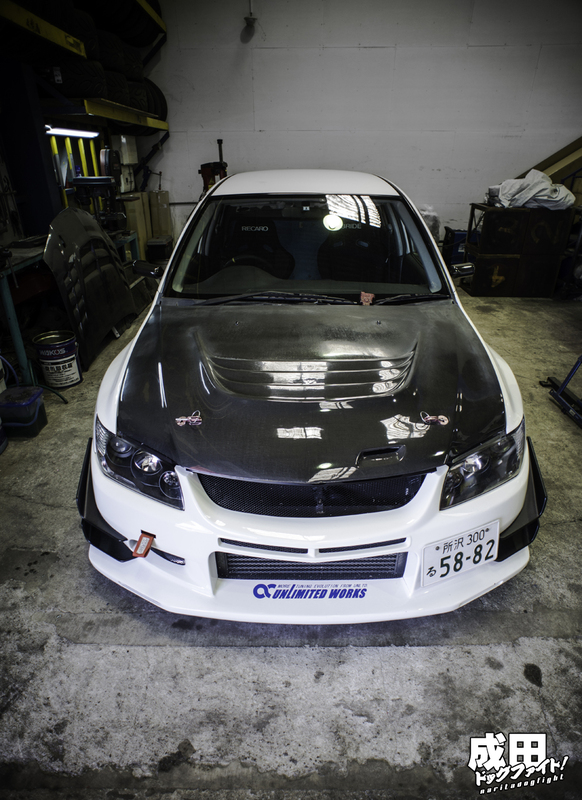 What is that device used on the fastest evo what looks like a device for installing heavy parts ?